Summer holidays were half over. Days without curfews (or, for some of us, days with extended curfews) would be coming to an end soon. Too soon. This was getting back to reality time. If you were a member of the library’s summer reading club, you could be in trouble if it was the first of August and you had read only four or five of the 10 or 15 books you had committed to reading over the holidays. This was something we signed up for every summer. It was a good incentive to get kids to pick up a book over the holidays and spend some time between the pages. And besides, there was always an acknowledgement of success at the end if you reached that goal and got a prize of one kind or another to go with it. Being slick operators we re-read titles we had read before: books like The Adventures of Tom Sawyer and The Adventures of Huckleberry Finn and The Hardy Boys because you could get through them easily and more important – actually know what you were reading. That was one way to reach your target by deadline. When you were really in a lurch and your back was against the wall because August had arrived and you were nowhere near your goal, you could borrow someone’s Classics Illustrated comics and read them instead of the real thing. That was bending the rules, I suppose, maybe it even was the “c” word – cheating – but at one time or another you had to do it, and we did it. Shhh! It was a well-kept secret. Or so we thought. I still recall being quizzed one day by librarian Miss Jones about whether I was really reading the titles that were recorded on my chart – the library’s version, that is, or if I was getting around it by reading the comic book versions of the great stories and doing book reports based on them. Word about these transgressions had leaked out (what more fitting place for “word” to leak than a library?) but apparently I was among the last to know. And so I was caught between a rock and a hard place, or perhaps more appropriately, between the library’s hard cover book and the Classics Illustrated comic book. Needless to say, it never came to that, thanks to Miss Jones. She turned out to be understanding and forgiving. I was allowed to remain a member of the summer reading club, but had to give my word – my verbal word – that I would not stoop to such misdemeanours ever again. I gave her my word, my verbal word right then and there, on the spot. And now you have my word, right here and now, in writing. A classic tale from yesteryear. This entry was posted in Uncategorized on July 30, 2014 by fromareportersnotebook. Monday, August 4 marks the 100th anniversary of the start of World War 1. Although this war was fought “over there” in parts of Europe, it had great impact on communities like Welland and its residents. The late historian, William H. Lewis, provides historical information with several local “story angles” and accounts in the third volume of his trilogy, Welland, Aqueduct, Merrittsville and Welland, A History of the City of Welland – The 20th Century. The chapter is titled The Great War 1914-1918, The First World War. Mr. Lewis devotes 30 pages to it, enhanced with newspaper clippings and photos. “On April 22, 1915, during the Second Battle of Ypres, German forces, for the first time threw poison gas against French troops, who fled, choking for breath. The following day, a second gas attack was directed against Canadain forces near the Belgian village of Langemarck. The Canadians, wearing handkerchiefs soaked in water or urine, held firm although outflanked and outnumbered four to one and thus began their reputation which was later described by a Canadian historian as the “deadliest Allied fighting force on the Western Front. Mr. Lewis also reported on the loss of Welland lives in the sinking of the RMS Lusitania off the coast of Ireland, torpedoed by a German submarine. 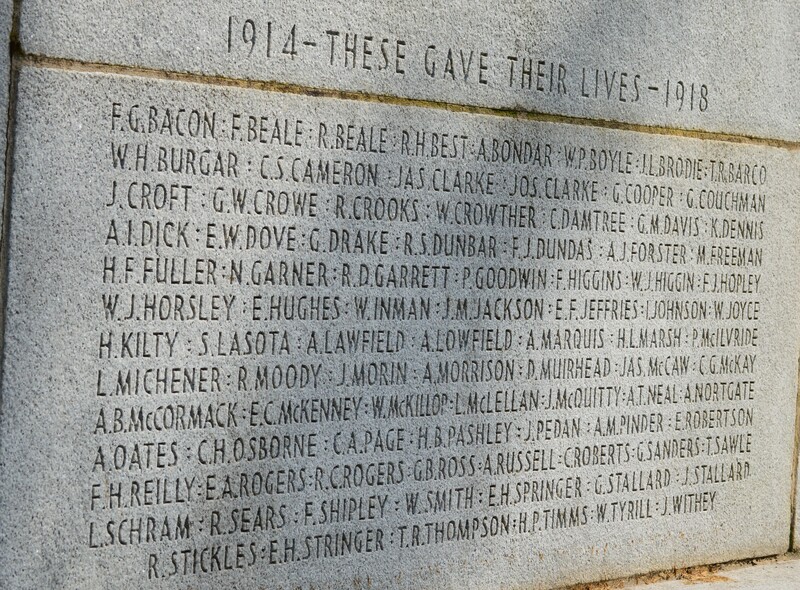 For more details and names of the local victims, read pages 106- 107. There’s more, of course and the chapter also provides some background about goings on here on the home front. The program says the monument was “the last large World War 1 memorial erected in Canada”. Its official unveiling was held September 4, 1939, three days after the start of World War 2. Of course, names of local dead in that war, and later in the Korean War were subsequently added to it. This summer, one of Welland’s always outstanding floral tribute beds on Prince Charles Drive (across from West Side Fire Hall) is dedicated to Canadian involvement in World War 1 (and also World War 2). It’s worth a look when driving or walking by. Perhaps – and hopefully – there will be local activities in recognition of the 100th anniversary of what (mistakenly) became known as “The War to End All Wars”, as Mr. Lewis refers to near the end of his chapter. The Welland-Crowland War Memorial is the last large World War 1 memorial erected in Canada. This entry was posted in Uncategorized on July 28, 2014 by fromareportersnotebook. A book of “tested recipes” provides a smorgasbord of 1931 Welland-area tastes and a who’s who of local businesses. 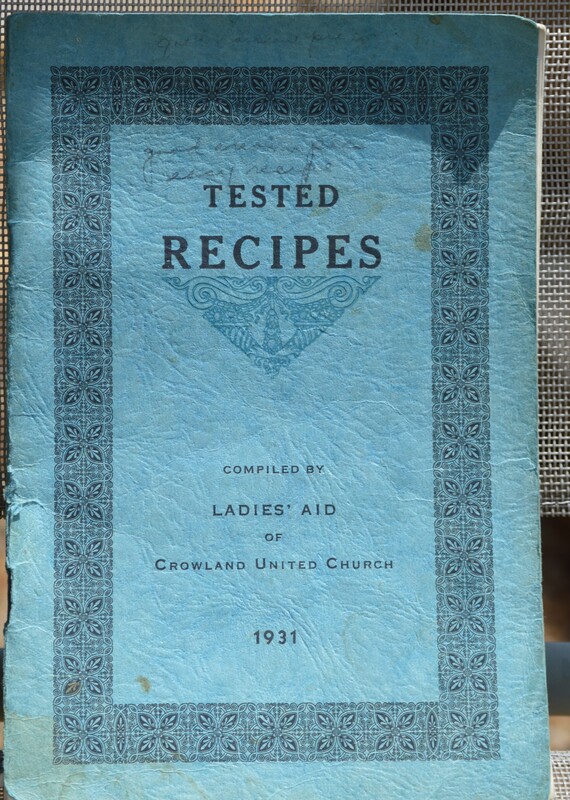 Tested Recipes is the title of the book, compiled by the Ladies’ Aid of Crowland United Church. Handwriting on the cover gives an endorsement: “good cream pie, easy recipe” the fading script notes. It’s part of my local history archive, one of several books that offer a connection with Welland of yesteryear. I had it out a few days ago and thought it could be turned into an interesting read. Although I could find no reference to Crowland United Church in local listings, there is one for Cooks Mills United Church (office) on Guest Road. Some of the small rural churches have closed in recent years, that may be the fate of Crowland United. The book’s recipes fall into 19 categories – everything from soups, bread and biscuits, and meats and vegetables to pickles and relishes, canning and preserving, sandwich fillings and beverages. Each section is introduced with a quote, for example: Bread and biscuits – “Chief nourisher in life’s feast” (Shakespeare); Salads – “To make a perfect salad there should be a mixer for oil, a spendthrift for vinegar, a wise man for salt, and a madcap to stir the ingredients (unattributed); and Beverages – “Except the water boiling be, Filling the teapot spoils the tea” (unattributed). Each of the recipes is accompanied by the name of the person who submitted it. Many of the names are still well known in the part of Welland that was formerly Crowland. Some examples: Matthews, Carl, Young, Hagar, Horton, Schisler, among others. A baker’s dozen of selected dishes: corn soup, noodles, baked macaroni and sausage, meat loaf, baked chops, Hungarian goulash, Boston baked beans, stuffed green peppers, creamed salmon, rhubarb and date pie, pumpkin pie with chocolate meringue, carrot pudding and Christmas pudding. Many of the dishes carry on today of course, handed down from one generation to the next but a few may have faded into obscurity. Three examples: Washday Pudding, Stepmother Cookies and Singing Hinney. Hmmmm. Does anyone still make this dish? And what is the significance of the name? The book also provides readers with some interesting “General Rules” and tips about “Stains” and “Large Amounts for Home Catering”. Four of the general rules: To shut in juices, meat should be subject to a high heat for a short time; Dry meats are improved by being larded; Do not pierce meat while cooking; and, Salt and pepper draw out juices. Four tips on removing stains: Grass – soak ½ hour in alcohol; Mildew – 1 qt. boiling water, add 1 tbsp. of chloride of lime and soak article 15 and (sic) 20 minutes Then wash thoroughly; Tar or Grease – Cover spot with lard or any grease and wash in warm soap and water; Fruit Stains – Boiling water poured from a height. And finally, a couple from large amounts for home catering: Boiled coffee to serve 100: 1 3/4 lbs. coffee, 2 eggs, 1 tsp. salt, 5 gallons of boiling water. Beat the eggs slightly, add shells which have been washed and crushed; add salt and ½ cup cold water. Tie loosely in cheesecloth. Drop in kettle of boiling water; cover tightly, boil very gently 15 to 20 minutes. Remove the bag. Note – Eggs may be omitted; Sandwiches – 1 large Sandwich loaf (3 lbs) cuts 60 to 70 slices. 1 small sandwich loaf cuts 20 slices. 1large loaf requires ½ lb. butter and ¾ lb. filling, if filling is made into mixture to spread as cheese or meat. 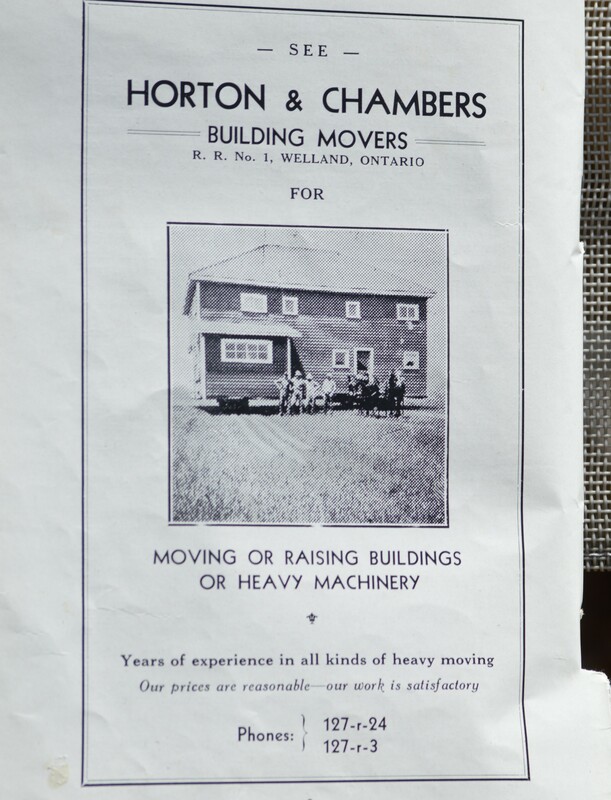 The members of the Ladies Aid were thoughtful enough to pay tribute to local businesses that advertised in the book. They asked readers to patronize the businesses for being good enough to support the project. 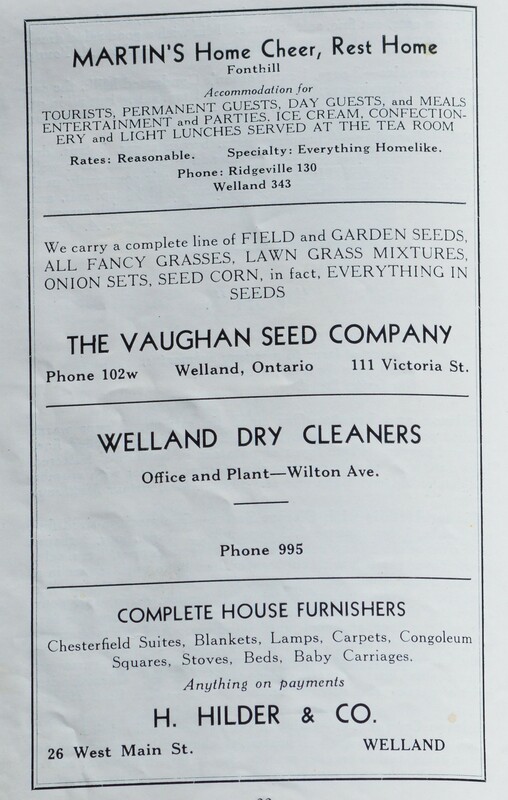 Many of the businesses were big names around town for years: Vaughan Seed Company, Welland Dairy, Welland Flour and Feed, R. Morwood Co., and optometrist N. J. Penwarden, among others. 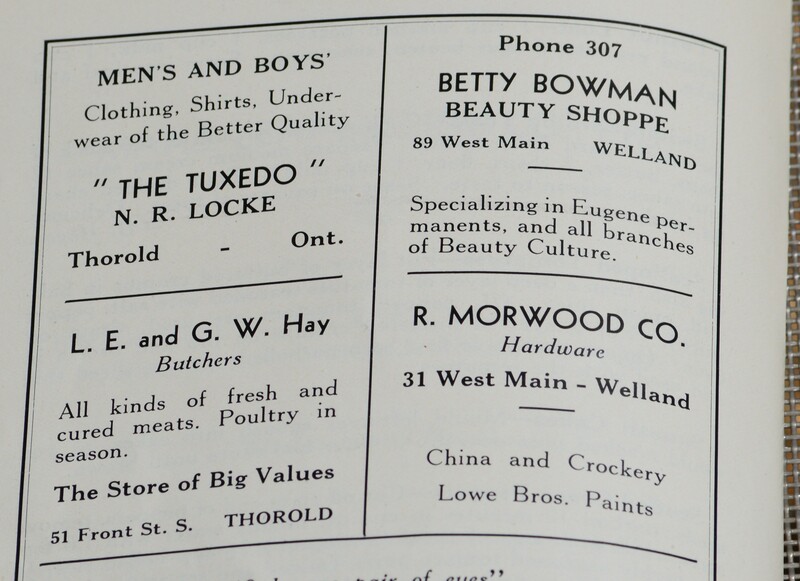 But others were small businesses of the day: Betty Bowman Beauty Shoppe, Miss McAllister (When in Welland…We invite you to call and see our stock of high class corsets, lingerie and specialty dry goods) and The Betty Shop (hemstitching, embroidery, buttons covered) and others. Ad by a local small business. But civilized men cannot live without cooks” – Owen Meredith. Hear, hear! I’ll drink to that! “You cannot plough a field by turning it over in your mind” – Rudyard Kipling. I grimaced. Here in Welland South neighbourhood’s own version of Eden, even a weed or two can go unnoticed by untrained eyes. 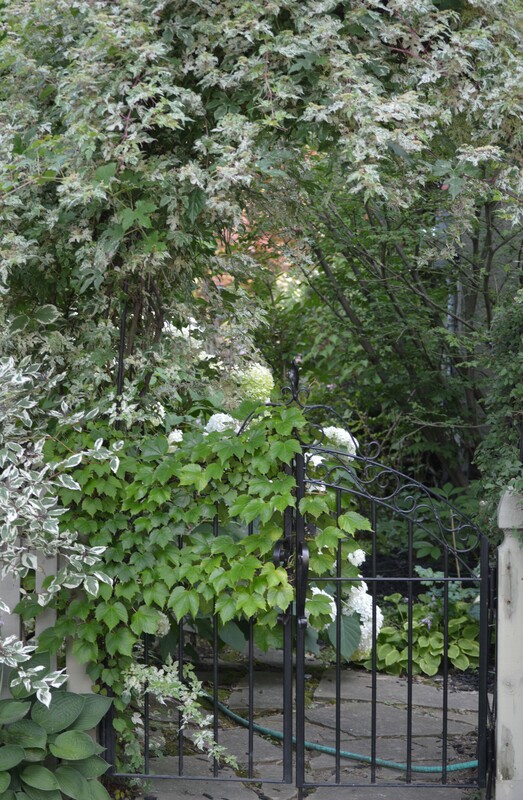 Our peepers are too busy taking in the lush scenery that distinguishes 42 St. George St. as “one of the best gardens in Welland”, to borrow the description of an appreciative neighbour. It’s not the biggest front yard you will find in the Rose City, but size doesn’t matter. Though I’ve been here a half dozen times, each new visit is better than the previous. 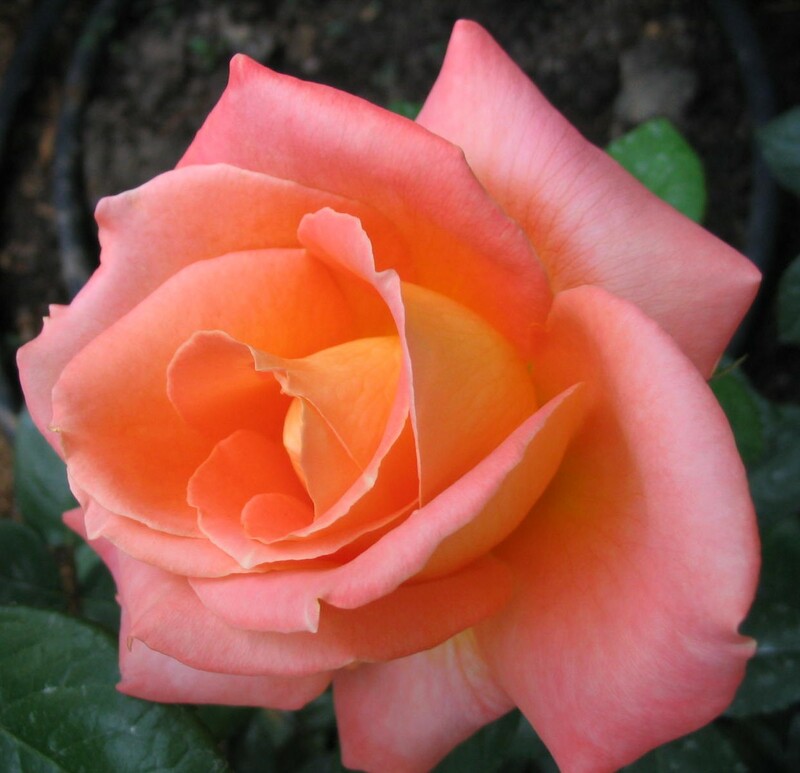 The gardener, Lydia Butera, attributes this to its maturing more so than to her doting care. “My life has changed,” she also says. “I have a grandson now.” The inference is there are other duties to occupy her time these days. But still, signs of her tender, loving care are everywhere. She knows, for example, the hideaways of tiny garden spiders. She points to silver strands of a web and amongst them a tiny black creature – a spider – I barely could see. A few feet down the garden path, she pointed out another. Now, that’s what I call knowing your garden. Hanging ferns adorn the front porch. 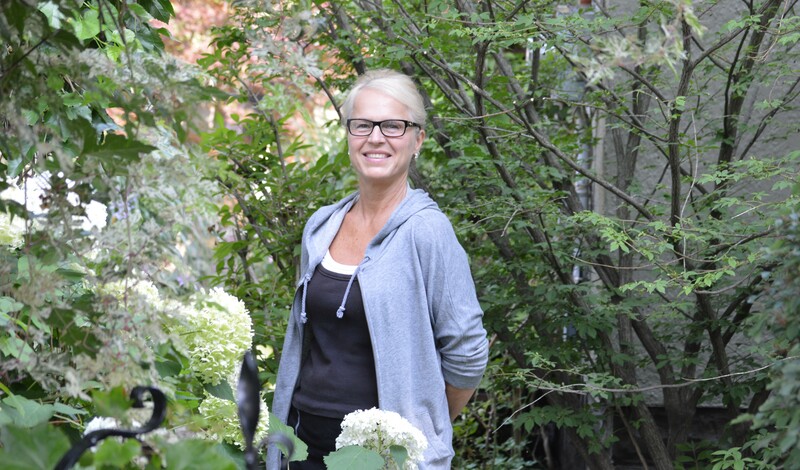 She and husband John purchased this property, off Broadway in Welland South, 30 years ago. When they arrived, it had grass and two trees. That’s all. The work has paid off handsomely. The view through the front gate gives the garden visitor a hint of what lies behind. Curb appeal is enhanced by two fantastic ferns hanging in baskets over the front porch. You are overcome with an urge to see more. 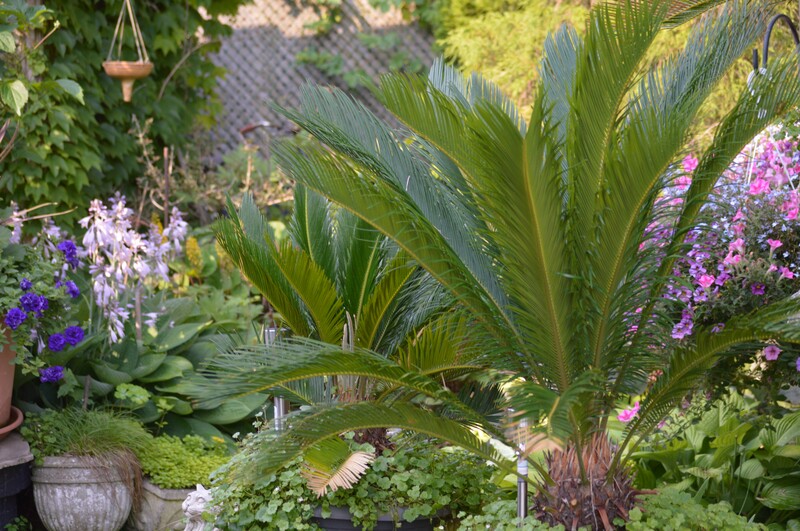 Sago palms, one of the “tropicals” in Lydia’s garden. They are moved to indoor locations in the fall, just before Halloween. There is a rich mixture of vines, succulents, tropicals, perennials and more. 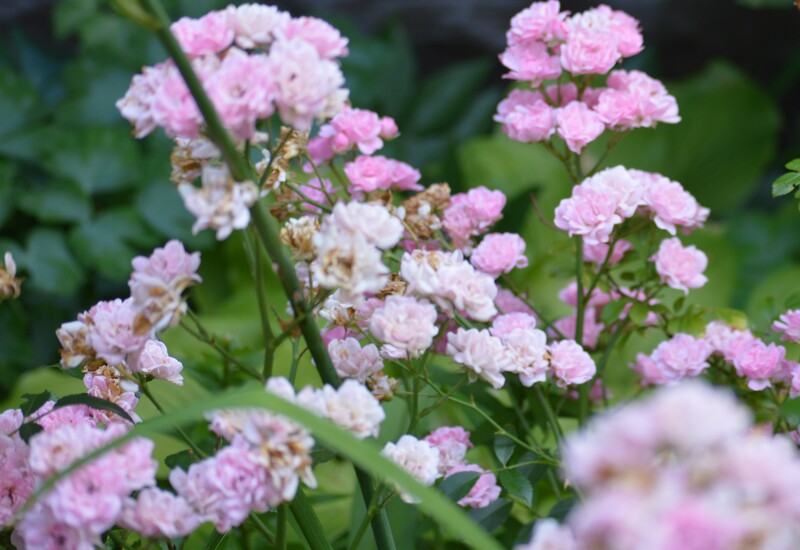 Some are readily recognizable, like snowball hydrangea while others are not so well known and require a crash course from the obliging gardener. Hostas are large and lush. I ask how many varieties she has. “Just say ‘many’, I’m not really sure any more,” she says with a smile. The hosta Sum and Substance nestles in a fern. She points out ostrich fern, not that it needed pointing out. She spreads apart the fronds to show the hosta Sum and Substance growing within: “It’s just nestled in there, cozy as a bug in a rug,” says Lydia. The ferns, she says, are among her earliest acquisitions, coming from places like “fields and the dump”. Who would have known? The statue of St. Francis has charm and character. 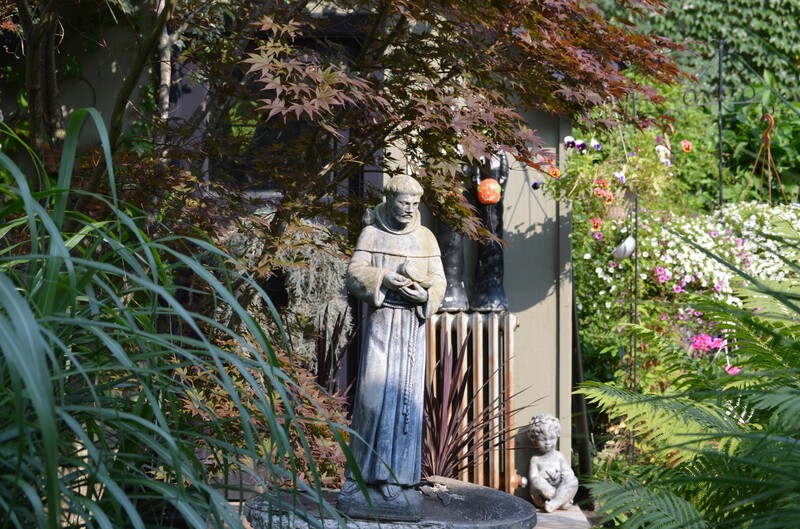 A focal point, from my point of view, is the statue of St. Francis which overlooks the side yard garden. It has character and charm. 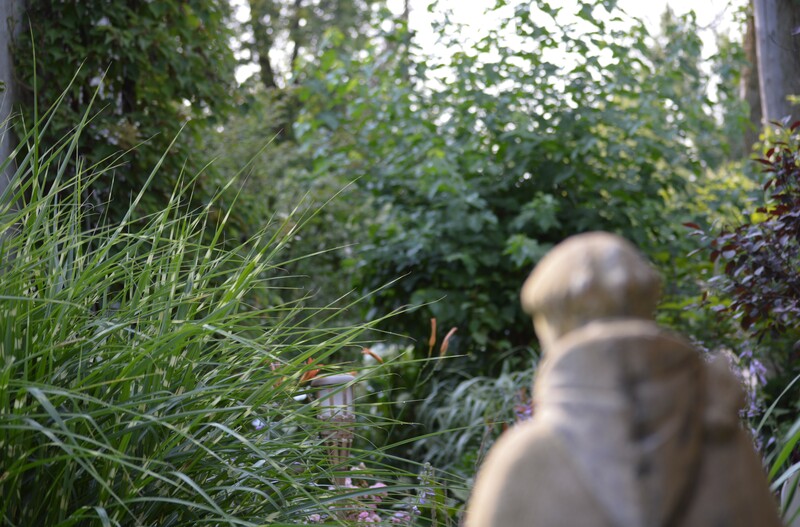 It captures the eye when looking from front of the yard to the back; but then a peek from behind – over the statue’s shoulder – provides a view of the visual feast of what he watches over day to day to day. A look over St. Francis’s shoulder. Does the gardener have preferences? Autumn clematis, variegated porcelain vine and tropicals, including banana trees, are among Lydia’s garden favourites. 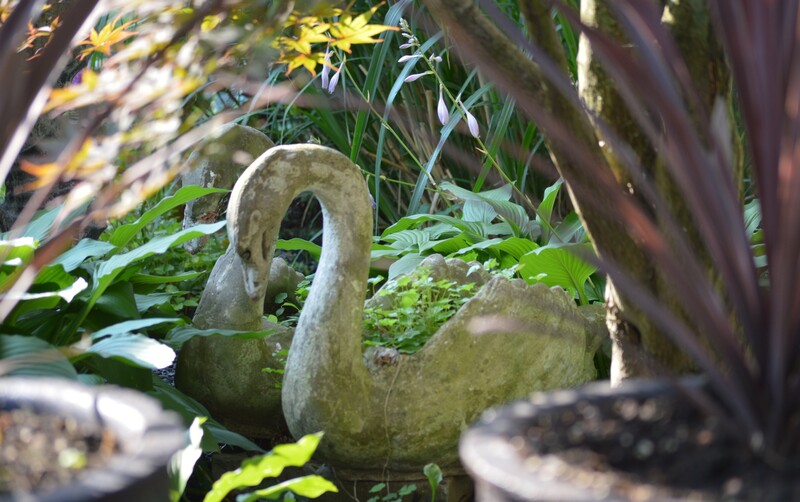 I wouldn’t know what to choose, where to start – the options in a garden that imitates Eden are so numerous and diverse. Leave it to Lydia. And I did. Purple Coneflower (Echinacea purpurea): “This striking magenta-pink flowering perennial hails from the tallgrass prairie of the Midwest and is at its best in mid to late summer. It is heat and cold hardy… Its name is derived from the centre of its daisy flower, which expands into an attractive, egg-sized, cone-shaped seed structure. Bees and butterflies are drawn to the flowers of this plant, which makes it a fixture in every butterfly garden. Later, the seed heads attract birds. 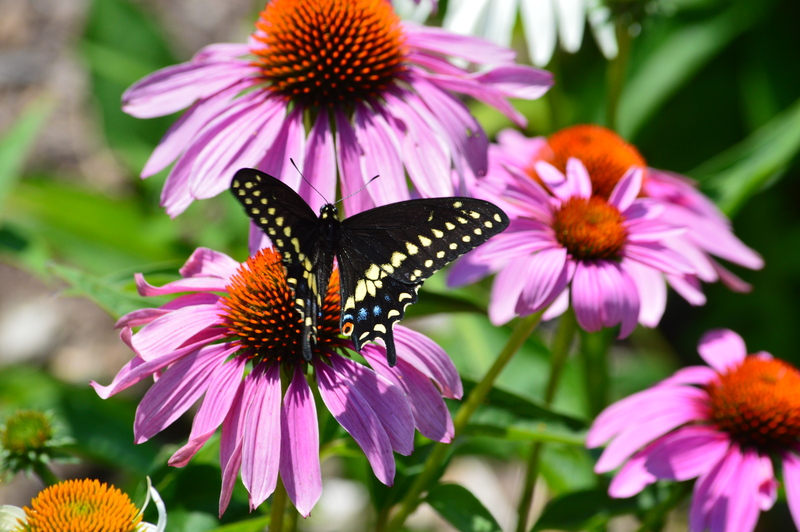 Butterflies are attracted to echinacea, like purple coneflower. The root of the purple coneflower was used as medicine by Native Americans, and echinacea is gaining prominence as an herbal supplement that stimulates the immune system…. Never pick, dig up or damage these plants in the wild. Overharvesting has caused them to become rare or disappear altogether from many wild places where they were once plentiful.’’ – Source: God in the Garden, Maureen Gilmer..
“Listen to a man of experience: thou wilt learn more in the woods than in books.” St. Bernard of Clairveaux, in Epistle 109. 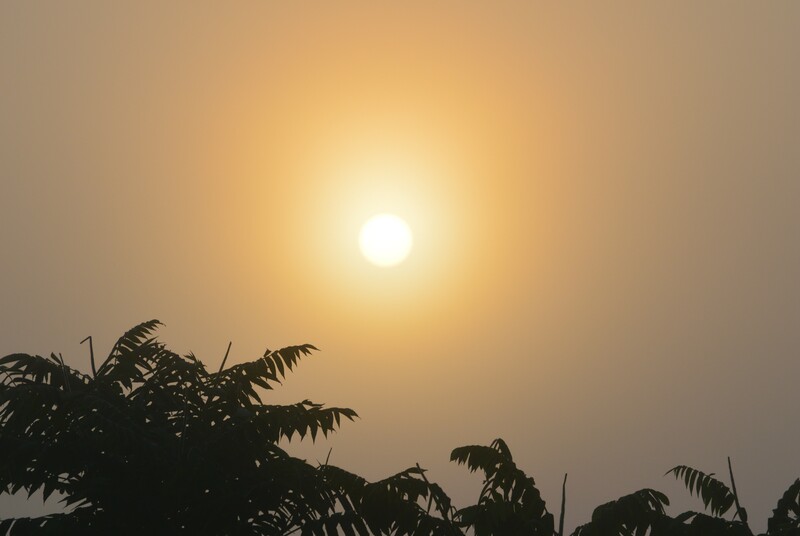 Sunset today, Friday, July 25: 8:38 p.m.
Sunrise tomorrow, Saturday, July 26: 5:40 a.m. This entry was posted in Uncategorized on July 25, 2014 by fromareportersnotebook. I have taken a liking to what is known as the retired life. The period of withdrawal after the opiate of a 43-year career in the same workplace had its ups and downs. That was back in November, 2012. Now it is July, 2014. As the saying goes: “Move on”. So I have. In my life now, there is no starting time, no finishing time. Deadline does not exist. The word has almost become meaningless. Now I’m finding what it can mean to be free as a butterfly. Well, within limits. Someone gave me some good advice. Unfortunately I did not heed it at the time, well at least not right away. I think it may have been Steve Krar, 90, the renowned Welland textbook author and educator. “Keep your hands busy, active, and your mind busier and more active,” he recommended. Another thing I learned: Don’t fall victim to Mad Men-like marketing ploys specializing events like “Seniors Day” sales. Why? I don’t want to let myself be herded into a niche that makes people of a certain demographic a special class, one might say. Besides, I think this demographic branding, as I call it, has a way of making people feel older than they are. Being retired gives one more time and more opportunity, to “give back”, as the saying goes. There is a shortage of volunteers and participants in community groups and organizations like no time before if the pleas for help from them can be believed. Postings are on bulletin boards in offices and public meeting places, in church bulletins and volunteer group newsletters. Giving back, especially with surplus time on one’s hands, can be good for the heart – and for the soul. My day starts – almost each and every day I might add – with a walk with our dog, Buddy. They have ranged from 15 or 20 minutes up to an hour or more. One learns the meaning of loyalty, friendship and unconditional love through a walk with a dog. When we return home, Buddy plops down beside my chair and does not move until I do. His way of showing appreciation, I suppose. The repetitive physical activity and increased consciousness about diet has helped me shed pounds and inches from my girth. My blood pressure is lower. I am liking being retired. The daily walks have led to bonding with nature. I know that sounds corny, but I’ve spent hours watching bees flit from one flower to another in pursuit of nectar to be made into honey, and equal time on watching the butterflies dance on wide open, inviting coneflower, a wildflower that has become one of summer’s joys. Although an admirer in years past, I’ve learned to take the time and enjoy the spectacle that goes on each and every day this time of year. It is more than a small joy, it has turned into a spellbinding, open-air recital starring busy bees and flirtatious, beautiful butterflies. Where is the marquee so that others can know about the performance? I have my rose beds, they require some tending to each and every day. I also have – purslane, (a variety of portulaca), which is highly invasive. Grrrr! Although some folks say it is healthy eaten as a salad, purslane is causing me to pull out my hair because it just can’t be brought under control and it is unsightly. Tending to and working in the garden is a way of keeping one’s hands very busy in retirement days. And so it is another day. “Stop the clock!” I still say, to no one in particular other than myself. There is no starting time, no finishing time in this still-new form of existence and no deadline. As I like to say: “It’s my life, sort of.” I am free as a butterfly. I am getting to like it that way. This entry was posted in Uncategorized on July 23, 2014 by fromareportersnotebook. This entry was posted in Uncategorized on July 22, 2014 by fromareportersnotebook.